Ear pain: Beware of otitis! Otitis is an inflammation of the outer or middle ear. There are several forms, differentiated by their sources and the affected areas. The most common forms of otitis, especially in young children, affect the middle ear. 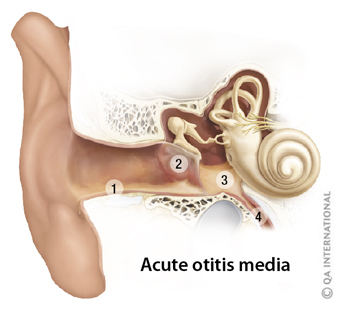 Acute otitis media is an inflammation of the middle ear caused by a viral or bacterial infection. It is often associated with rhinopharyngitis and angina, whose infectious agents can easily spread from the throat via the eustachian tube. As this passageway is much shorter in children, they are more vulnerable to middle ear infections, up to 6 years of age. Acute otitis media appears as ear pain, fever, decrease in hearing, and increased irritability, sometimes accompanied by vomiting and diarrhea. Acute otitis media often leads to inflammation of the eardrum, called myringitis. Myringitis is characterized by a red appearance of the eardrum, which may also blister or bulge. In the most serious forms of myringitis, the eardrum may be pierced, with pus seeping out from the middle ear through the external auditory meatus (otorrhea). In this case, a rapid treatment is necessary (antibiotics, paracentesis). If not treated correctly, acute otitis media can lead to serious complications: spread of the infection (meningitis, labyrinthitis, or mastoiditis) and/or facial paralysis. Otitis media serosa, or seromucous otitis, is an inflammation of the middle ear caused by obstruction of the eustachian tube, preventing the drainage of secretions. The eustachian tube may be blocked by infection, allergic reaction, large adenoid vegetation (tonsils), or a congenital malformation. If the obstruction does not go away, otitis media serosa can become chronic and can permanently damage the hearing. Otitis media serosa can also develop into acute otitis media, if an infectious agent is introduced into the middle ear.Depending on the cause of the obstruction, the disease is treated using antibiotics or corticoids, or by surgery (paracentesis or adenoidectomy). Otitis externa is an inflammation of the external auditory meatus (ear canal) or of the outer wall of the eardrum, most often caused by infection. The infection, caused by a microscopic fungus or a bacterium, is favored by moisture (swimming) and by irritants. Otitis externa appears as intense, shooting pains, itching, and discharge (otorrhea). Its treatment focuses on the use of antiseptic, antibiotic, or antifungal drops. Paracentesis is a surgical incision in the eardrum to ventilate the middle ear or drain out the pus that it contains. Performed under local or general anesthesia, paracentesis is often followed by the installation of a transtympanic ventilator, a hollow tube creating a passage between the middle and outer ears. Recommended in the case of chronic otitis, particularly in children, the transtympanic ventilation tube remains in place for 8-12 months before being naturally expelled by the body. A cholesteatoma is a benign tumor that develops in the middle ear, starting at the eardrum or in the external auditory meatus (ear canal), due to injury to the eardrum or a congenital malformation. The cholesteatoma gradually expands, destroying the tissues of the middle ear, then those of the inner ear, and leading to chronic otitis, tinnitus, vertigo, and irreversible deafness. 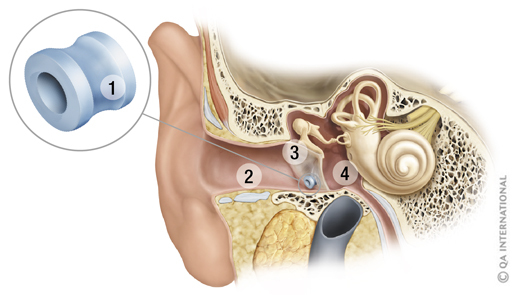 It is treated surgically by removing the tumor and reconstructing the eardrum and the ossicles.